When I asked my son Warren what theme he’d like for his 5th birthday, he was very clear that he’d love Angry Birds Space. The wheels in my head starting turning about how I would implement that theme into a cake. When I asked me more about kind of cake he’d like, he took much of the guesswork out for me. 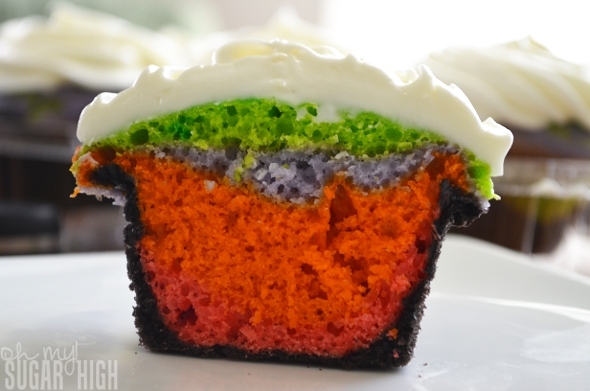 He wanted rainbow cupcakes. 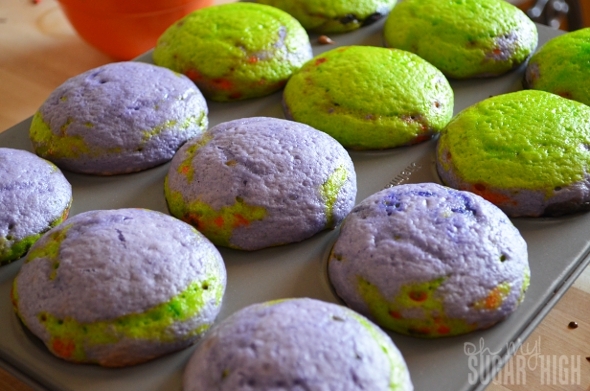 It was pretty easy to decide to make colorful cupcakes using colors from Angry Birds Space and so these cupcakes were born! 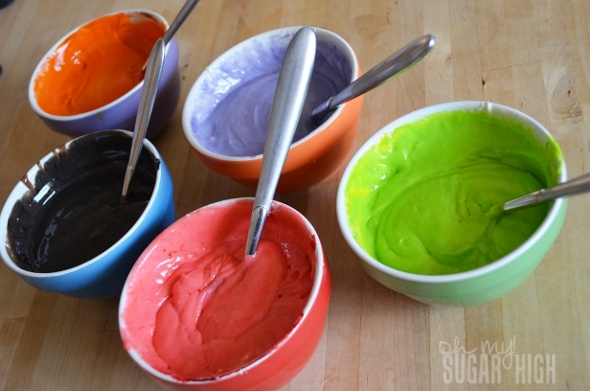 To create the cupcakes, I used a golden vanilla cake mix and followed the wonderful recipe which includes yogurt or sour cream and full instructions from Our Best Bites to make their colorburst (rainbow) cupcakes. 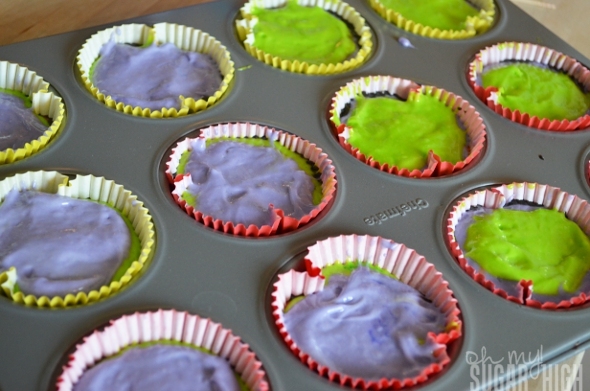 The only difference was I wanted some black included in my cupcakes for “space” but in a more understated way. To do that, I simply made up a chocolate cake mix, following the box instructions and adding just a small amount of black dye. 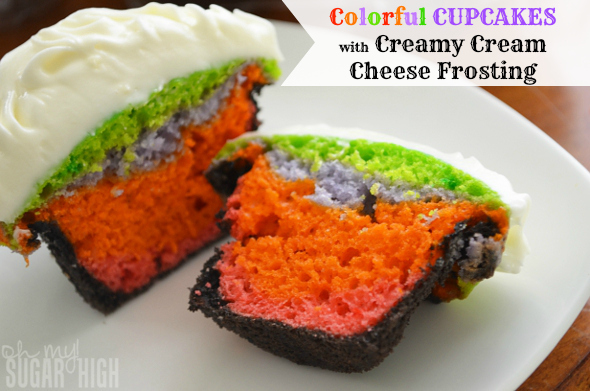 Because the batter was thinner for the chocolate mix, the black cake enveloped the entire bottom and sides of this colorful cupcake. 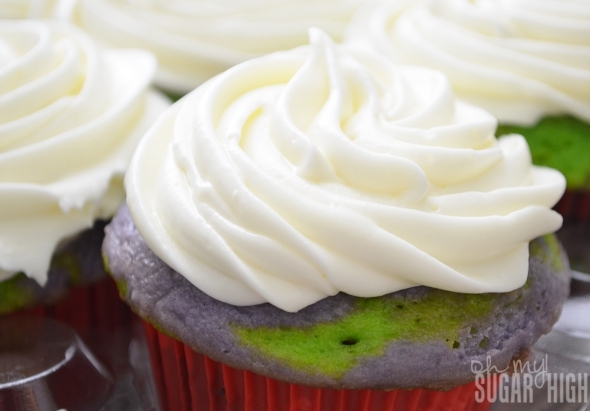 If you would prefer to have it as an actual layer in your cupcake, be sure to use the same recipe for thicker batter as for rest of your layers. I played around with the layers a bit so that the cupcakes had some variety but you can certainly make them all the same if you prefer. The thicker batter and water on your finger tip is really helpful for spreading and separating out the layers so be sure to read all of the great advice at Our Best Bites. Don’t they look fun? Warren helped me make them and thought they were so “cool” when they came out of the oven like this. Since Warren doesn’t really have a favorite kind of frosting, I decided to go with my personal favorite, cream cheese frosting. It isn’t always the easiest to work with when trying to use a 1M tip to create a swirl so I decided to go with a frosting that incorporates just a bit of whipped topping. I would recommend going with a regular buttercream however if you have hotter temperatures when you make this. Since it is generally freezing in February in Minnesota, it wasn’t a problem for us. 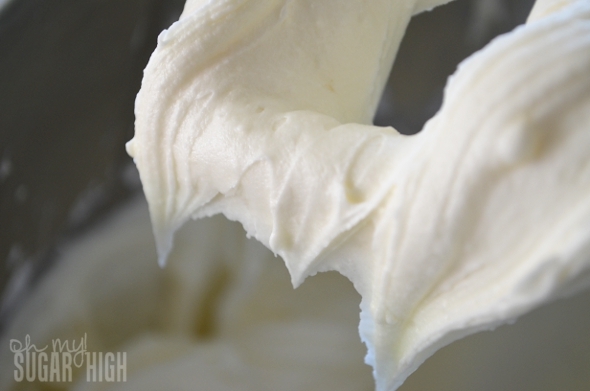 If you like a thick cream cheese cheese frosting, you can refrain from adding any whipped topping (Cool Whip). You can see in the photos it is much stiffer at this point. 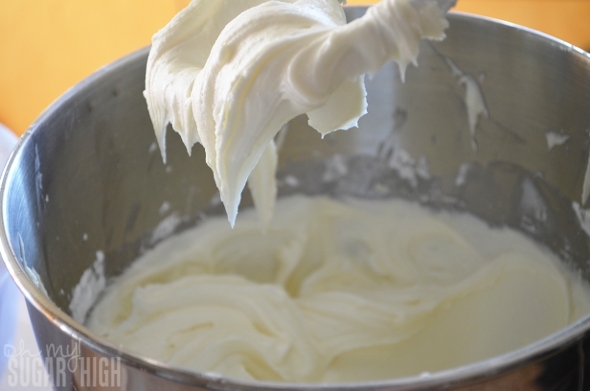 Once you add the Cool Whip, the consistency is much creamier! This would tastes especially light and fabulous on virtually any cake! 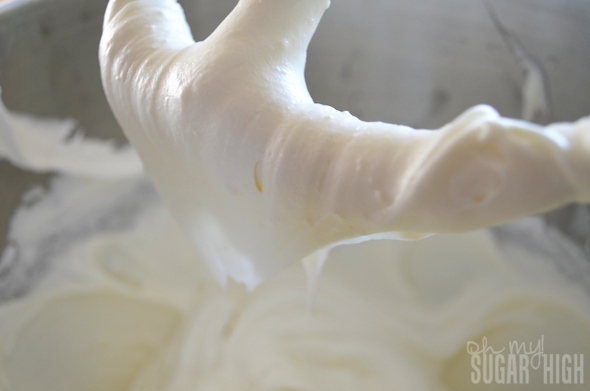 Cream the butter, cream cheese, vanilla and milk until light and fluffy. This will take a couple of minutes. Add in the sifted confectioners sugar. Beat until right consistency. You may need to add more sifted confectioner’s sugar or milk if you aren’t getting the desired results. Gently stir in Cool Whip frozen topping just until blended. Refrigerate leftovers. With this recipe you will get approximately 3 cups of frosting. I had plenty of frosting for 24 cupcakes. 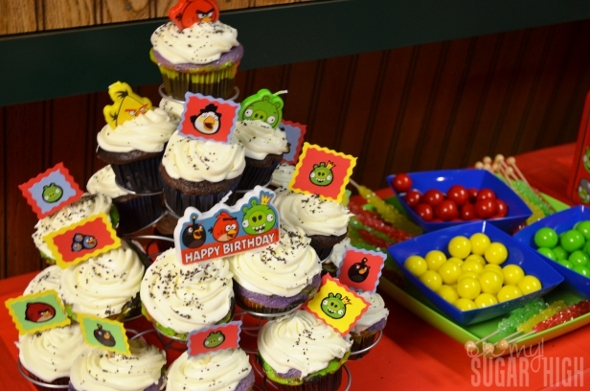 I made my own Angry Birds Cupcake Toppers and used some fun candles from Party City and a Wilton Cupcake Stand to display them. The birthday boy was very happy with how they turned out and the guests were pleasantly surprised by all the color inside! For those of you who love Pinterest like I do, here is larger graphic just for you! Frosting recipe inspired by food.com. Some of the items shown in this post were provided by Party City.